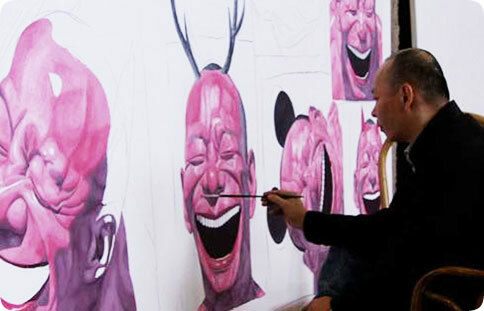 The meteoric rise of Chinese contemporary art over the past decade has grabbed the attention of the global art world. It seems as though, out of nowhere, Chinese artists were fetching record prices at auction for their works, curators were running to Beijing and Shanghai to quickly assess the situation and schedule exhibitions, and dealers and collectors were flocking into artist studios and buying directly from the artists. In reality, artists from Mainland China had been quietly experimenting with contemporary art in the late 1970s and, as soon as Deng Xiaoping launched economic reforms of the early 1980’s, they were searching for fresh ways to express themselves. China’s long artistic history with its rich heritage of painting and calligraphy had only known a relatively short period of modern art before it was cut off from most of the world during a civil war, followed by World War II, and then the Communist takeover under Mao Zedong’s chairmanship until his death in 1976. At the onset of Deng Xiaoping’s reforms, foreign literature, philosophy, art and music rapidly found their way into China where artists consumed any material they could get their hands on. From Jean-Paul Sartre to Teresa Teng: Cantonese Contemporary Art in the 1980s is an excellent film about this pivotal moment in the early chronology of Chinese contemporary art. The film focuses on a particular group of artists located in the southern province of Guangdong –mainly in the city of Guangzhou (formerly Canton). Its proximity to Hong Kong and Deng’s initiative to create a special economic zone in this region uniquely positioned artists from this area to be innovators and leaders in the contemporary art scene. The film is organized in chapters, each one introduced with a concise description contextualizing the cultural landscape. The artists, critics, and art historians who are interviewed respond in either Mandarin or Cantonese dialect with English subtitles. They were all key players in the evolution of Chinese contemporary art but were quite distinct from the artists in Beijing, Shanghai, Chengdu and elsewhere. They formed artist’s associations, salons and groups, and organized their own exhibitions and forums. An articulate discussion of the underlying intellectual currents that informed, inspired and motivated the artists is clearly presented. The art scene that unraveled in the north of China, centered around Beijing and Shanghai since the 1990s, has been somewhat chaotic and driven primarily by speculators. Yet, very talented artists have risen to the forefront of the art world and continue to play important roles in creating avant-garde work and shaping the next generation of artists. China: The Empire of Art? (in Mandarin and French with English subtitles) attempts to portray these key figures as well as collectors and curators who have had a hand in this recent period of Chinese art history. However, the film falls short on several fronts: without a background in this period or any prior knowledge of the people being interviewed, the viewer is not provided a context to understand why these people are significant or what their contributions have been to the field. There is no connection from one interview to the next, nor is there any depth of discussion. Additionally, a number of people who should have been included in the film are notably absent. The result is a random series of ‘snapshots’ of some of the highest profile personalities in the Chinese contemporary art world. In many ways, the film reflects the unruly and rapid development of the art scene which left many insiders and bystanders confused. Both films are appropriate for college level and will be helpful for anyone studying contemporary art, art history, and contemporary China. Viewed together, they complement each other. Viewed independently, China: Empire of Art? provides a superficial overview of some of the ‘rock stars’ in the field and can serve as a basic introduction which can be followed up with more in-depth materials. From Jean-Paul Sartre to Teresa Teng offers an intellectual context to a specific piece of the ever growing and diverse Chinese contemporary art world. From Jean-Paul Sartre to Teresa Teng: Cantonese Contemporary Art in the 1980s is distributed by Asia Art Archive.